I know some of you are coders and programmers out there! Well these awesome series are for you. 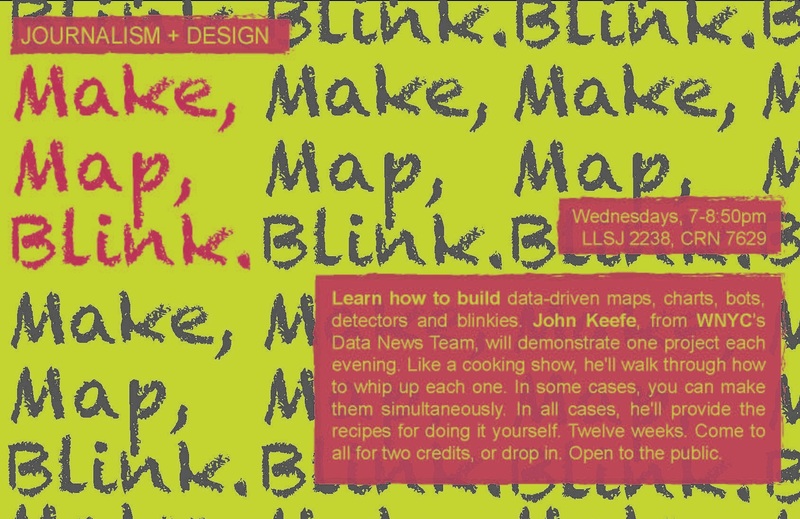 Journalism + Design is an interdisciplinary program at The New School in Manhattan, merging design thinking with time-tested journalistic principles and practice. We invite you and your students to two event series that explore the new frontier of Journalism. Both series are free and open to the public. 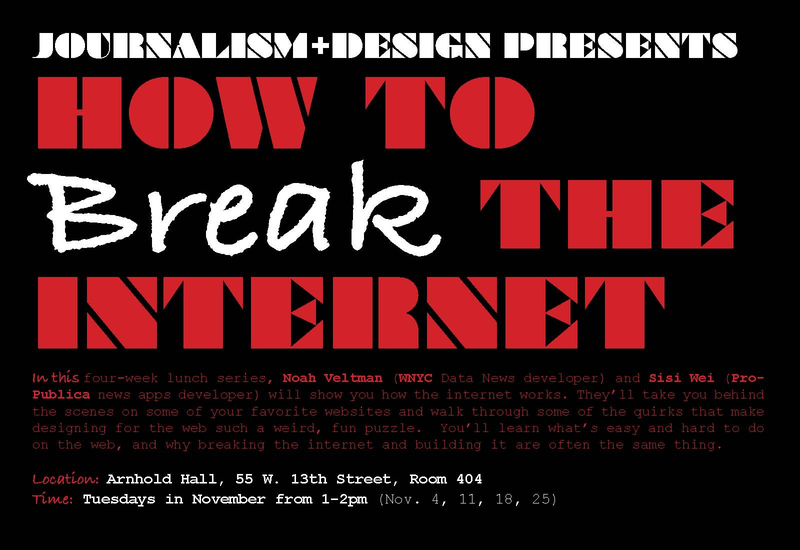 In this four-week lunch series, Noah Veltman (WNYC Data News developer) and Sisi Wei (ProPublica news apps developer) will show you how the internet works. They’ll take you behind the scenes on some of your favorite websites and walk through some of the quirks that make designing for the web such a weird, fun puzzle. You’ll learn what’s easy and hard to do on the web, and why breaking the internet and building it are often the same thing. Learn how to build data-driven maps, charts, bots, detectors and blinkies. Keefe will demonstrate one project each evening, most of which have direct journalistic applications. Like a cooking show, he’ll walk through how to whip up each one. In some cases, you can make them simultaneously. In all cases, he’ll provide the recipes for doing it yourself. Questions can be directed to Heather Chaplin, Director, or Kim Lightbody, Program Coordinator. Journalism + Design is a collaboration between Eugene Lang College and Parsons at the New School. Journalism + Design is generously funded by the Knight Foundation.